Polygala myrtifolia grows wild in South Africa fynbos areas. The Polygala genus includes more than 300 species of flowering plants that grow mostly in temperate and tropical regions around the world. The one we call sweet pea bush was cultivated as a cross of the myrtle-leaf milkwort P. myrtifolia, a common South African shrub of the Cape fynbos (FINE-bose) region. (The term fynbos comes from the Afrikaans words for "fine bush," a reference to the low stature of most plants that grow there.) Sweet pea bush is a popular landscaping plant and attracts hummingbirds. 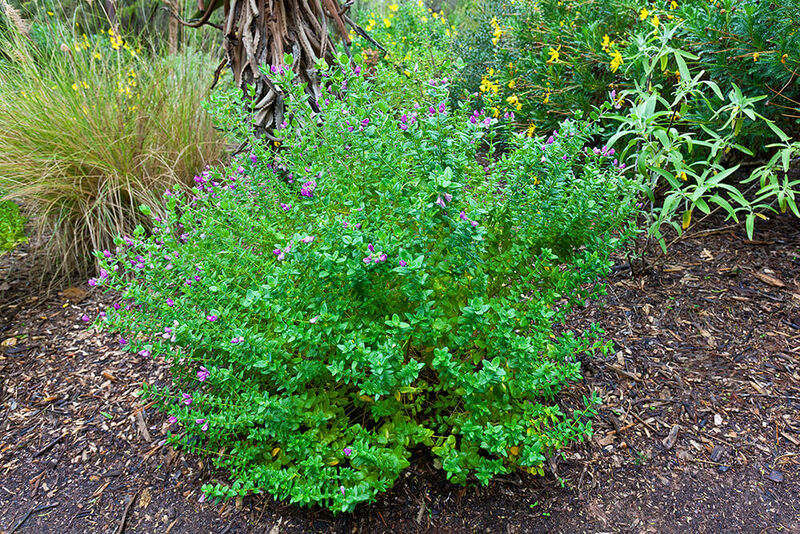 This shrub grows in a loosely rounded mound that can be about 3 to 5 feet (1 to 1.5 meters) high and just as wide. Its attractive, grayish-green leaves are small—about an inch (2.5 centimeters) long—and they provide a pretty green canvas for this shrub's brilliant display of purplish-pink, sweet pea-shaped flowers. Each blossom is made up of two winged petals surrounding a lacy center. The sweet pea bush flourishes in a wide range of climates and locations. It is frost-hardy to at least 24 degrees Fahrenheit (-4 degrees Celsius), and grows quickly in well-draining soil, in full sun or part shade. Once established, it requires little irrigation, which makes it a good choice for water-smart California gardens. Sweet pea bushes brighten up a garden with their profusion of flowers, which bloom spring through fall in colder climates and may bloom year-round in milder zones. They can be propagated by cuttings. Sweet pea bushes are as beautiful in containers or rock gardens as they are massed in borders or hedges. Blooming sweet pea bush stems make a lovely contribution to a flower arrangement. The genus name Polygala comes from the Greek for "much milk." Farmers believed that milk production went up when their cows munched on these shrubs. The cultivar dalmaisiana is named for French gardener M. Dalmais, who happens to be the same person responsible for cultivating the first perpetual-flowering carnations, in the 1840s.